Statistics for Finance develops students’ professional skills in statistics with applications in finance. 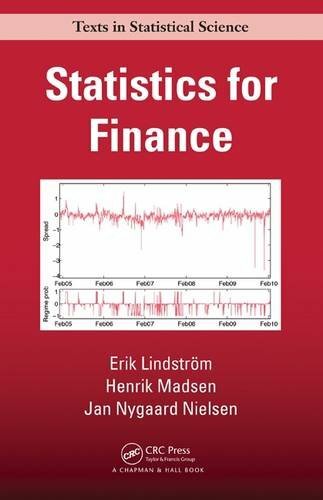 Developed from the authors’ courses at the Technical University of Denmark and Lund University, the text bridges the gap between classical, rigorous treatments of financial mathematics that rarely connect concepts to data and books on econometrics and time series analysis that do not cover specific problems related to option valuation. The book discusses applications of financial derivatives pertaining to risk assessment and elimination. The authors cover various statistical and mathematical techniques, including linear and nonlinear time series analysis, stochastic calculus models, stochastic differential equations, Itō’s formula, the Black–Scholes model, the generalized method-of-moments, and the Kalman filter. They explain how these tools are used to price financial derivatives, identify interest rate models, value bonds, estimate parameters, and much more. This textbook will help students understand and manage empirical research in financial engineering. It includes examples of how the statistical tools can be used to improve value-at-risk calculations and other issues. In addition, end-of-chapter exercises develop students’ financial reasoning skills.